THE FAMILY MICROCHARMIDAE WAS SYNONYMIZED WITH BUTHIDAE BY VOLSCHENK, MATTONI & PRENDINI IN 2008! This small family only includes 2 genera and 15 species [Updated 15.12.08]. The members of this family were orginally placed in the Buthidae, and have just recently been put into their own family (Akentrobuthus was returned back to Buthidae in 2000). 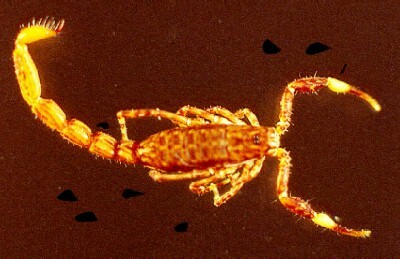 These scorpions are very small (adults are between 7 - 16 mm). 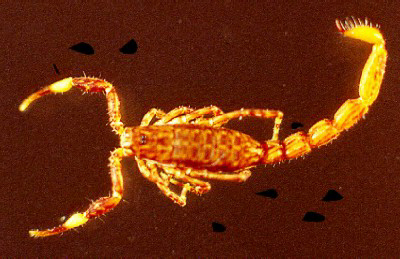 The scorpions in this family are found in Africa (Democratic Republic of Congo and Madagascar), where they inhabit the litter in humid forests. Lourenço described the genus Neoprotobuthus from Madagascar in 2000. This new genus seems to share characters both with the Microcharmidae and the Buthidae, and seems to have an intermediate possision between these two families. Because the genus share more characters with the Microcharmidae, Lourenço placed the new genus in this family. Lourenço, Goodman & Fisher, 2006 described six new species of Microcharmus and synonymized Ankaranocharmus with Microcharmus. No scorpions of this family have been reported to occur in captivity. No data has been found about the venom of these scorpions, but as former members of the Buthidae, they should be presumed to have a venom of some power.